During World War II, 15 men were hanged as spies in Great Britain, either at Pentonville Prison or Wandsworth Prison. Many of those spies were hanged by Albert Pierrepoint, a man who would eventually become known as Britain's Most Efficient Executioner. 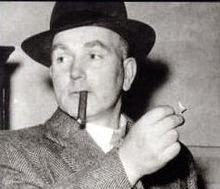 Pierrepoint served as a hangman from 1932 to 1956 and during that period executed about 435 people, including 202 German War Criminals in the post-war period. In 1951, Pierrepoint set a record for the fastest hanging - a total of seven seconds. Ten years earlier, however, in December 1941, Pierrepoint experienced one of the most stressful hangings of his career when German spy Karel Richter fought his fate to the bitter end. Had Josef Jakobs not been tried by a General Court Martial, he too would have probably have met his death at the hands of Pierrepoint. "I have come to the conclusion that executions solve nothing, and are only an antiquated relic of a primitive desire for revenge which takes the easy way and hands over the responsibility for revenge to other people ...The trouble with the death penalty has always been that nobody wanted it for everybody, but everybody differed about who should get off." In researching the life of this fascinating man, I came across a couple of YouTube videos, both of which I highly recommend. The second is a fictional film, also released in 2006 entitled simply Pierrepoint. Timothy Spall plays Pierrepoint and does a great job. There are several versions of the film available on YouTube. The first version, available here, has the film in its entirety, albeit with English subtitles, which get to be a bit annoying after a while. The second version presents the film in 9 segments of about 10 minutes each - see below. Albert Pierrepoint - Obituary in The Telegraph, 13 July 1992.